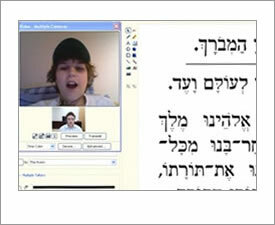 Numerous boys have studied for their Bar Mitzvahs online with live video with trained rabbi instructors. Lessons are conducted one-on-one in a fun and meaningful way! Our goal is for our students to be motivated and excited to accomplish what they want to cover for their Bar Mitzvah to the best of their ability. Our instructors are experienced with teaching and are always available for support and guidance for the Bar Mitzvah, Judaism, and general questions and information. Bar Mitzvah lessons will vary in content based on student's prior education and the goals that one wishes to reach. Goals will be set based on the student's prior Judaic knowledge and length of study for the Bar Mitzvah. Our qualified teachers can teach your son to read Hebrew, sing the brachot for his aliyah, read the haftarah, the maftir, a portion of or the entire Torah portion. 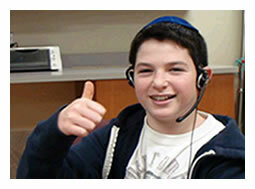 Lessons can also include learning a Bar Mitzvah speech and how to lead the prayer services. The initial Bar Mitzvah assessment with one of our qualified teachers and first trial lesson is FREE. The cost per lesson is $35.00 and usually is scheduled for once a week until the big day! 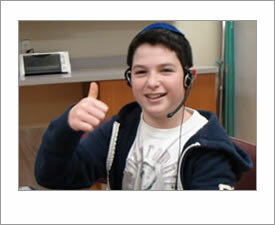 Each Bar Mitzvah Lesson includes 45 minutes online 'one on one' study with our trained teachers. The lesson are run through our cutting-edge interactive online classroom platform. The lesson material will be posted directly on the communication board so the student will be able to follow the lesson directly on his computer screen in real time. After each lesson, our teacher will email the student a video recording of the lesson and will instruct the student on how to review the material. Students are expected to review the material in between lessons for about 10 minutes per day. Enroll your son with confidence! Yes. All lessons are conducted one-on-one with your son via live webcam to ensure personal attention and to keep things at a pace that works for your son's individual needs. Our team of teachers will work with you and your son to create a schedule that first your needs. A typical lesson is about 45 minutes, but this can be adjusted based on your preferences. How long before the bar mitzvah should we start our lessons? Depending on the reading level of the student and how much he intends to chant on the day of his event, the optimal preparation time can vary from six months to one and a half years. The sooner the lessons start the less pressure it may be on the Bar Mitzvah boy. Please keep in mind, though, that there are all types of options to tailor to your child's needs. What if my son can't read Hebrew? No problem! Our teachers have trained many students to read Hebrew. With simple and fun teaching methods our teachers will enable your child to proudly get up in front of the synagogue and chant his portion with confidence. If there is not enough time available for your child to learn how to read Hebrew, we can prepare him quickly on how to be called up to the Torah for an Aliyah and read the Torah Blessings with transliteration. 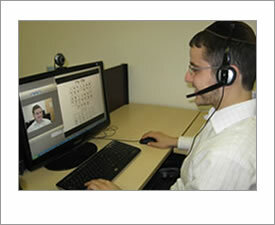 If my son trains online, which synagogue do I actually have the Bar Mitzvah at? Our staff will happily set you up with a synagogue of your choice or introduce you to a rabbi and synagogue in your area and discuss any particular needs for the service. Our team would be happy to help you contact a rabbi and help make arrangements for the service. What kind of computer and sofware do I need? 1. A computer or laptop - Just about any computer running Windows, Macintosh or Linux software will work. Our technical support department can assist with any questions you may have. 2. An internet connection - A high speed internet connection is recommended. 3. Headset with microphone - You can purchase these at any computer store or online. These headsets are convenient because they have ear pads for comfort and a microphone that comes around to the mouth allowing your hands to remain free. I would like to thank you so much for the confidence that you gave my son. He was hesitant at first and but ended up doing so well in the synagogue. My family was very impressed. Our son had such a beneficial and fun time learning online for his Bar mitzvah, I wish these online lessons were around for our oldest son. Thank you so much for the wonderful experience and keep up the good work you are doing for boys around the world. Thank you so much for helping our son Daren prepare for his big day. When we started thinking about who would prepare our son for his Bar Mitzvah, we didn't have any ideas. We found your webiste online and are very thankful for your help. Our son did a wonderful job. My family was very impressed by the way Jordy performed. He read his portion well. My experience with this service as a parent was great - convenient for Jordy to just sign on to the computer, no driving involved, and very easy to reschedule if needed. As a busy parent this worked out well for us. Thank you! !